This fritters is very well known within the Orang Ulu community. 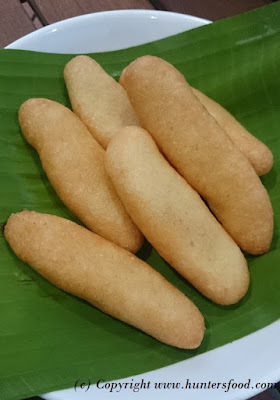 I saw this fritters sold at a popular Orang Ulu's restaurant in Miri but I never tried it. I got the recipe and method from my Kelabit ex-colleague. Its very simple to be made and since I like glutinous rice in any form of cooking, I took to it naturally. The fritters is crispy on the outside, chewy on the inside. 1. Toss the glutinous rice and let it dry enough. You can use pestle & mortar, dry miller or food processor to make glutinous rice flour. Although it is not necessary to sieve, I preferred to do so to ensure consistency (good mixture of fine and slightly coarse flour). 2. Mix in the sugar and toss evenly. 3. Add in few tablespoons of water and mix slowly to form a dough. Add in few more drop until it can be moulded. To replace glutinous rice, one can use a mixture of glutinous rice flour and rice flour with a ratio of 4:1. Pernah ku mkn tok di Miri. Mun pake tepung pulut dlm packet ya dapat sik?